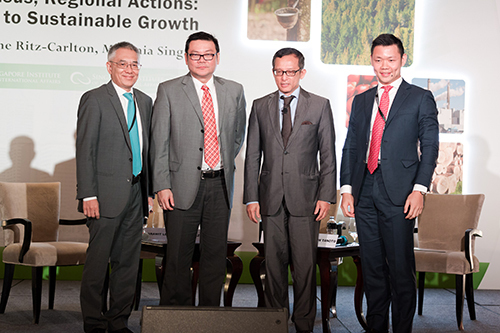 Mr Thirawit Leetavorn, Double A’s Senior Executive Vice President (leftmost) during the Panel 1 of the recently held 3rd Singapore Dialogue on Sustainable World Resources. He shared Double A's unique approach to sustainable management of resources, with emphasis on land and trees, the key resources for pulp and paper manufacture. According to him, “working with farmers is the key for pulp and paper sustainability. Double A doesn’t want to take land away from farmers – rice farmers instead are encouraged to grow trees between their paddy fields.” Mr Leetavorn’s co-panellist was Mr Anderson Tanoto (rightmost), Director of Royal Golden Eagle Pte. Ltd. The panel keynote was Mr Nazir Foead (second from left), Head of Indonesia’s Peatland Restoration Agency, while Prof. Simon Tay (second from right), Chairman of Singapore Institute of International Affairs was the moderator.